The vehicle is equipped with an electronically controlled continuously variable transmission (multitronic®). Unlike conventional automatics, the gear ratios are not shifted in fixed steps but continuously variable. This gives smoother transmission and makes for better fuel economy. The gearbox selects the gear ratio and shifts up or down automatically according to the gear change programmes stored in the control unit. If desired, you can also select the gears manually (tiptronic mode). Please note that on vehicles with a multitronic® gearbox, torque is transmitted via a multi-plate clutch, and not via a torque converter as on conventional automatics. This means that the car will not “creep” as much as conventional automatics when the engine is idling if you stop temporarily with the selector lever in position D, S or R.
The vehicle is equipped with an electronically controlled 6-speed automatic gearbox. The gearbox changes up and down automatically. The gears are changed automatically. – Press and hold the brake pedal. – Press and hold the interlock button (the button in the selector lever handle), move the selector lever to the desired position, for instance D, and release the interlock button. – Wait for the gearbox to engage the gear (a slight movement can be felt). – Release the brake and press the accelerator ⇒ . – Apply the foot brake to hold the vehicle when stationary (for instance at traffic lights). – To prevent the vehicle from rolling away, apply the parking brake before moving off on steep gradients ⇒ . – As soon as you accelerate as normal, the parking brake will automatically be released and the vehicle will start moving. – Press and hold the brake pedal ⇒ . – Apply the parking brake. – Press and hold the interlock button, move the selector lever to P and release the interlock button. The engine can only be started when the selector lever is at P or N.
On level ground it is sufficient to move the selector lever to P. On a gradient the parking brake should be applied first and the selector lever should be moved to P. This reduces the load on the locking mechanism and makes it easier to move the selector lever out of position P.
Vehicles with multitronic® gearbox: Your vehicle is equipped with the hill hold assist function which makes it easier to drive away on a slope. The system is activated when you press and hold the brake pedal for a few seconds. When you release the brake pedal the braking force will be maintained for a moment in order to prevent the vehicle rolling back when you drive away. • Do not press the accelerator while selecting a gear with the vehicle stationary and the engine running, as this could cause an accident. • Please note that some power will still be transmitted when you stop temporarily with the selector lever in position D, S or R. For this reason, to avoid risking an accident, apply the footbrake firmly when stopping to prevent the vehicle rolling away. 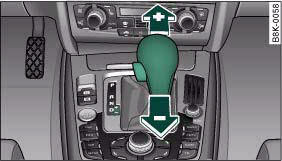 • Never move the selector lever to R or P when driving, as this could cause an accident. • Vehicles with multitronic® gearbox: Please note that some power will still be transmitted when you stop temporarily with the selector lever in position D, S or R. For this reason, to avoid risking an accident, apply the footbrake firmly when stopping to prevent the vehicle rolling away. This section covers all the selector lever positions. 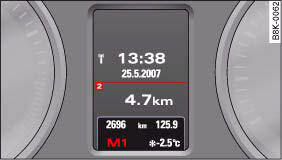 The current selector lever position is shown in the instrument cluster display. This locks the driving wheels mechanically. The parking lock must only be engaged when the vehicle is stationary ⇒ . The interlock button (the button in the selector lever handle) must be pressed in and the brake pedal must be depressed before moving the selector lever either in or out of position P. The lever can only be moved out of position P when the ignition is on. When reverse gear is engaged the gearbox automatically selects the lowest gear ratio. Reverse gear must only be engaged when the vehicle is stationary and the engine is idling ⇒ . To move the selector lever to position R, press in the interlock button and at the same time press the brake pedal. Depending on the model, one or two reversing lights will come on in selector lever position R (when ignition is switched on). In this position the gearbox is in neutral ⇒ . In this position the gearbox automatically selects the best gear ratio. This depends on the engine load, the road speed and the dynamic gear control program (DCP). Press the brake pedal when moving the selector lever from N to D if the vehicle is stationary or at speeds below 5 km/h ⇒ . In some situations (such as on mountain roads or when towing a trailer or caravan) it can be advantageous to switch temporarily to tiptronic mode, so that the gear ratios can be selected manually to suit the driving conditions. Select this position if you wish to take full advantage of the car's performance. This setting makes use of the engine's maximum power output. When accelerating the gear shifts will be noticeable. Press the brake pedal when moving the selector lever from N to S if the vehicle is stationary or at speeds below 5 km/h ⇒ . • In selector position D or S the vehicle must always be held with the foot brake when the engine is running. This is because an automatic gearbox still transmits power even at idling speed, and the vehicle tends to “creep”. The throttle must on no account be opened inadvertently (for instance by hand from the engine compartment) when a gear is engaged with the vehicle stationary. The vehicle could otherwise start moving immediately (in some cases even if the parking brake is engaged) and possibly cause an accident. • To avoid accidents, apply the parking brake and put the selector lever in position P before opening the bonnet and working on the vehicle with the engine running. Please observe the important safety warnings, “Working on components in the engine compartment”. 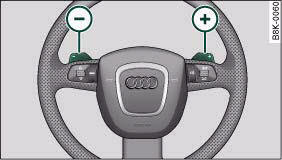 You can select the sport program for gear changes on vehicles with Audi drive select* by activating the DYNAMIC mode. There is no S position on the selector lever. • If the lever is moved accidentally to N when driving, release the accelerator and let the engine speed drop to idling before selecting D or S again. • For the sake of fuel economy (and the environment), the gearbox ratios on some models are designed so that maximum speed is only obtained when the selector lever is at position S.
The selector lever lock prevents gears from being engaged inadvertently, so that the vehicle is not set in motion unintentionally. 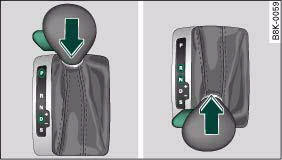 – Press the brake pedal and at the same time press in the interlock button. WHEN STATIONARY APPLY FOOTBRAKE WHILE SELECTING GEAR. The selector lever lock only works if the vehicle is stationary or driving at speeds up to 5 km/h. At higher speeds the selector lever lock in the N position is disengaged automatically. The selector lever lock is not engaged if the selector lever is moved quickly through position N (e.g. when shifting from R to D). This makes it possible, for instance, to “rock” the vehicle backwards and forwards if it is stuck in snow or mud. The selector lever lock engages automatically if the brake pedal is not depressed and the lever is in position N for more than about a second. The interlock button on the selector lever handle prevents the driver from inadvertently engaging particular gears. Press the button in to disengage the selector lever lock. 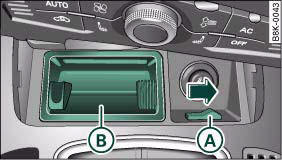 The illustration shows the selector lever positions in which the button has to be pressed, highlighted in colour ⇒ fig. 179. The key can only be withdrawn with the ignition switched off and the selector lever in position P. When the ignition key is removed, the selector lever is locked in position P.
The kick-down feature is designed to give maximum acceleration. When the accelerator pedal is pressed right down past the point of resistance at full throttle, the gearbox will select a lower gear ratio, depending on road speed and engine speed. While you keep the accelerator depressed the engine speed is automatically controlled to give your vehicle maximum acceleration. When the accelerator pedal is pressed right down past the point of resistance at full throttle, the gearbox will shift down to a lower gear, depending on road speed and engine speed. The upshift to the next higher gear is delayed until the engine reaches maximum rpm. Please note that if the road surface is slippery or wet, the kickdown feature could cause the driving wheels to spin, which could result in skidding. The automatic gearbox is controlled electronically. The vehicle is equipped with an electronically controlled gearbox. The gear ratios are selected automatically according to preset gearshift programmes. When you drive at moderate speeds the gearbox will select the most economical shift programme. It will then change up early and delay the downshifts to give better fuel economy. If you drive at higher speeds with heavy acceleration, if you open the throttle quickly, or if you use the kick-down or the car's maximum speed, the gearbox will automatically select the more “sporty” shift programmes. The gearbox is self-adapting, and continuously selects the most suitable shift programme. At the same time, the driver can also make the gearbox switch to a more "sporty" programme by pressing the accelerator quickly. Depending on road speed, this makes the gearbox shift down early into a lower gear ratio for more rapid acceleration (for instance to pass another vehicle), without having to press the accelerator all the way down into the kick-down position. After the gearbox has shifted back up it returns to the original programme, depending on your style of driving. Vehicles with multitronic® gearbox: The gearbox continuously adapts the gear ratios on uphill gradients. If the brake pedal is pressed on a downhill gradient the gearbox automatically shifts to a lower gear ratio. This increases the engine braking effect. Vehicles with tiptronic gearbox: The gearbox adapts the gearshifts for uphill and downhill gradients. This prevents the gearbox from shifting up and down unnecessarily on uphill gradients. With the manual shift programme (tiptronic) the driver can manually select pre-programmed gears. – From position D, push the selector lever to the right. As soon as the automatic gearbox has changed over to this programme, the display will show the selected gear. – Briefly push the selector lever forwards (in the tiptronic gate), fig. 180 +. – Briefly pull the selector lever backwards (in the tiptronic gate) -. With the tiptronic system the driver can manually choose between 7 different pre-programmed gears. The manual programme can be selected either with the vehicle stationary or on the move. When accelerating, the gearbox automatically shifts up into the next gear shortly before the maximum engine speed is reached. If you select a gear which is lower than the gear shown in the instrument display ⇒ page 166, fig. 181, the gearbox will only shift down when there is no longer a risk of overrevving the engine. When the vehicle slows down (for instance when braking), the gearbox automatically shifts down into the next gear when the minimum engine speed is reached. Changing down to a lower gear increases the engine braking effect on downhill gradients. When the accelerator pedal is pressed right down past the point of resistance at full throttle, the gearbox will select a lower gear, depending on road speed and engine speed. A back-up system is in place should a fault occur in the control system. The automatic gearbox switches to the back-up programme if a fault should occur in the control system. This is indicated by all segments of the display panel either lighting up together or going out completely. It is still possible to move the selector lever to all positions. The manual shift programme (tiptronic) is not available when the backup programme is active. Vehicles with tiptronic gearbox: When the selector lever is in position D or S or in the manual shift programme, the gearbox will remain in 3rd gear if 1st, 2nd or 3rd gears were engaged when the fault occurred. The gearbox will remain in 5th gear if 4th, 5th or 6th gears were engaged. The gearbox will then engage 3rd gear when you drive away from a standstill or after the engine is restarted. It will still be possible to use reverse gear in the normal way. However, the electronic lock for reverse gear will be switched off. Should the gearbox ever switch into the back-up programme, you should take the vehicle to an Audi dealer or qualified workshop as soon as possible. The paddle levers on the steering wheel enable the driver to manually select pre-programmed ratios or gears. – Briefly pull the left-hand paddle lever - to change down to a lower gear. – Briefly pull the right-hand paddle lever + to change up to a higher gear. The paddle levers are activated when the selector lever is in position D or S, or the position for the manual shift programme (tiptronic). 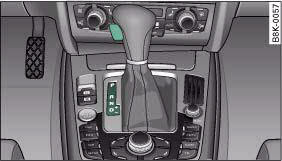 The manual shift programme can, of course, still be operated using the selector lever in the centre console. The selector lever can be released manually if the electrical power supply should fail. The manual release mechanism is behind the ashtray. – Slide open the cover for the ashtray. – Slide the switch A ⇒ fig. 183 to the right to release the ashtray. – Take out the ashtray B. 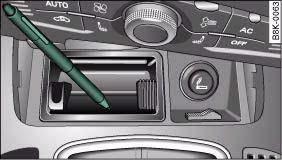 – You will now see a small cover cap at the front of the opening in the ashtray mounting unit. – Loosen and remove this cover cap. – Use a screwdriver or similar object to press down the pin, which is now accessible, and hold it down ⇒ fig. 184. – Now press the interlock button on the selector lever and move the selector lever to position N.
The selector lever can only be moved out of position P if the ignition key is inserted and the ignition is switched on. If the power supply should ever fail (discharged battery, etc.) and the vehicle has to be pushed or towed, the selector lever must first be moved to position N. This is possible after operating the manual release mechanism.